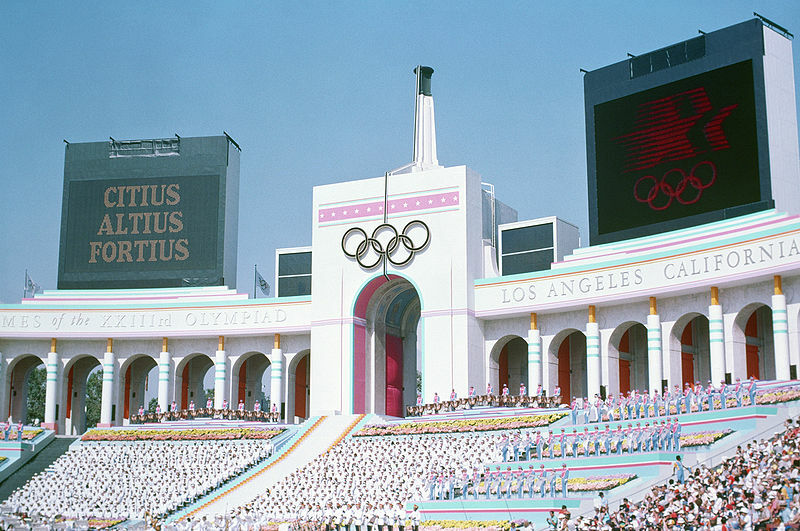 The last time the Olympics were in Los Angeles was 1984. Opening ceremonies have since gotten A LOT fancier. The Summer Olympics officially kick off in Rio this Friday, which means I’m about to disappear into a haze of swimming and gymnastics fangirling. My favorite story so far is the one about how my beloved gymnast King Kohei apparently racked up a $5,000 bill trying to play Pokémon GO in Brazil. As the festivities and competitions get underway in Rio, Metro and LA2024 will be hosting our own celebration of the Olympic Games and L.A.’s Olympic history, by giving you the opportunity to meet an Olympic gold medalist from the past. The Olympians will be appearing at various Metro stations starting this Friday, August 5, and then from Aug. 8 through 12 and Aug. 15 through 19. All appearances will take place from 4:30 p.m. to 6 p.m.
El Monte Bus Station, Aug. 5 — Paul Gonzales, Gold Medal in Boxing Light Flyweight at the 1984 Los Angeles Games. Union Station, Aug. 8 — Shirley Babashoff, three-time Gold Medalist in swimming at the 1972 Munich Games and 1976 Montreal Games. Sierra Madre Villa Station, Aug. 9 — John Naber, four Gold Medals, one Silver in swimming at the 1976 Montreal Games. Culver City Station, Aug. 10 — John Naber, four Gold Medals, one Silver in swimming at the 1976 Montreal Games. North Hollywood Station, Aug. 11 — Julianne McNamara, Gold Medal in Uneven Parallel Bars at the 1984 Los Angeles Games. Atlantic Station, Aug. 12 — Brenda Villa, Gold Medal in Women’s Water Polo at the 2012 London Games. Chatsworth Station, Aug. 15 — Rafer Johnson, Gold Medal in Decathlon at the 1960 Rome Games. 7th Street/Metro Center, Aug. 16 — Valerie Brisco, three Gold Medals in 200 meters, 400 meters, 4×400 meters relay at the 1984 Los Angeles Games. Downtown Long Beach Station, Aug. 17 — Lisa Fernandez, three-time Gold Medal winner in Softball at 1996 Atlanta Games, 2000 Sydney Games and 2004 Athens Games. APU/Citrus College Station, Aug. 18 — Bryan Clay, Gold Medal in Decathlon at the 2008 Beijing Games. Downtown Santa Monica Station, Aug. 19 — Mark Spitz, nine-time Gold Medalist in Swimming at the 1968 Mexico City Games and 1972 Munich Games.